The Walt Disney World Resort is home to over 14.7 miles of monorail track that serves seven stations, two theme parks, and three resort hotels. Disney World's monorail fleet has been in operation since the Magic Kingdom opened in 1971. When Epcot was built, the track was expanded to add another 4 miles to connect it to the Magic Kingdom loop in 1982. The design of the Disney monorail initiated in Germany, was first implemented in Disneyland in California, and has been refined over the last 40 years. 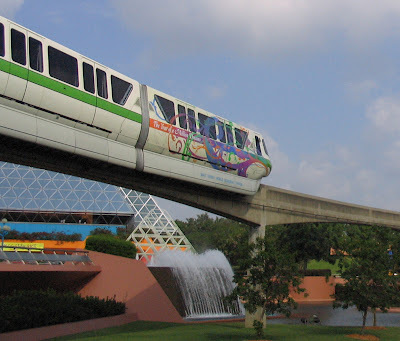 The futuristic look of the monorail fits nicely with the advanced technology that is used throughout Disney World. The Disney World fleet currently consists of twelve trains. They are each six-car trains that are 203 feet long and have 124 rubber tires powered by 600-Volt DC propulsion systems. The Mark VI trains are the current state of the art model that is in use. Each of the trains is designated by the color of the stripe along the side of the train. On a typical day, more than 150,000 guests utilize monorail transportation. The system has the capacity to transport nearly 7,000 guests in each direction every hour. Park guests can use the monorail service free of charge while visiting the Walt Disney World Resort. It provides transportation from the Ticket & Transportation Center to The Magic Kingdom, Epcot, the Polynesian Resort, the Grand Floridian Resort, and the Contemporary Resort. Patient guests may also get the opportunity to ride up front with the driver of the monorail for a truly special experience. Special Tip: Don't forget to ask the monorail operators if they have any free Disney World Transportation Trading Cards. There are 12 different monorail cards out of the 18 card set. Riding the monorail at Disney World had always held some sort of coolness factor. Who can't help but be impressed as the monorail actually goes through the Contemporary Resort. The elevated track gives wonderful views that you can't get anywhere else. Even after all these years the sleek form of the monorail looks modern. This is certainly helped by the fact that as you are delivered to the Magic Kingdom you arrive right in front of the old steam train station. The silent, electric powered monorails certainly fit right in as they make their loop through the Future World section of Epcot. Even if you are not staying in one of the Disney Resorts on the monorail line, don't miss one of the truly Disney experiences. Make a point on your next trip to ride the monorail, just for the sake of riding it. 0 comments to "Explore Disney World's Monorail System"